ALL MINT NEVER HINGED WITH ORIGINAL GUM. 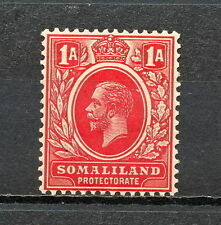 ED VII British Somaliland Protectorate 1903. Set of 6 SG 25-30 MM. 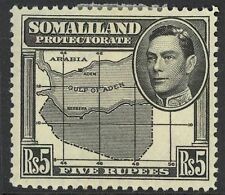 QV Somaliland Protectorate SG 1-9. Somaliland 1953-58 set SG137/48 MM - lightly hinged but the 15c and 10s. have tiny gum thins and the 1s30. has a gum thin. MLH/MM (etc) - a mix of MLH and MM with the majority being MLH. MLH - Mint Light Hinged - lightly hinged no hinge remainders. SOMALILAND - 1903 QV ½a YELLOW-GREEN WITH AMAZING OVPT. ERROR RESULTING IN "S" VIRTUALL OMITTED AND "M" LARGE PART OMITTED, MOUNTED MINT(MH). REST OF THE WORLD - £2.00. NO INTEREST | NO CATCHES | NO SMALL PRINT. REST OF WORLD. INTEREST-FREE CREDIT OPTIONS UK Personal Cheque. Complete set of 1953 definitives. Mint, never hinged. SG = Stanley Gibbon Catalogue. SG(18)=Stanley Gibbon (part 18) Japan & Korea. SG(9)=Stanley Gibbon (part 9) Portugal & Spain. VFU ="Very Fine Used" with either a clear neat cancel or a neat corner cds, well centred for issue with nice perfs, and 4 margins on imperfs. SOMALILAND SG13 1903 5r ULTRAMARINE & VIOLET. A FINE MOUNTED MINT STAMP. Somaliland Protectorate 1957 commercial used airmail cover used to U.K.
Somaliland Protectorate 1953-58 set to 10s (including 10c salmon), SG 137-48 (including SG 138a). Mint lightly hinged (top 4 values mint never hinged). Catalogue value £137 . Rest of the world: GBP £2.30. SOMALILAND PROTECTORATE #21//O12 MINT HINGED. CONDITION NOTE: #23 and #31 have small hinge thins. 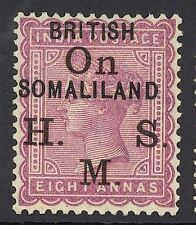 SG 1-13 British Somaliland ½d - 5r set of 13. Very fine used CAT £190. Excludes sending to P.O. Boxes: £10.00. SOMALILAND PROTECTORATE, SCOTT# 128-130(3)139, TOTAL 4, MINT VERY LIGHTLY HINGED. SOMALILAND PROTECTORATE, SCOTT# 123-125(4), TOTAL 4, MINT VERY LIGHTLY HINGED. Somaliland 1904 3r green and black, SG 43. Lightly mounted mint. Rest of World (international signed for) £8.50 . Somaliland 1904 5r grey-black and red, SG 44. Lightly mounted mint. Rest of World (international signed for) £8.50 . 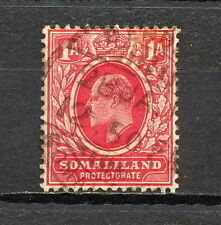 SOMALILAND PROTECTORATE SG85, 5r black & scarlet, M MINT. Cat £95. SOMALILAND SG137/48 1953-8 DEFINITIVE SET. BR SOMALILAND 1948 BMA 25c on Armoured Car Sq FORCES cover ex MOGADISHU...53949. SOMALILAND 1903 ½a GREEN WITH 'SOMAL.LAND' VARIETY SG 25d MINT. 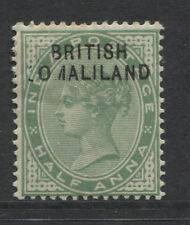 1903 ½a GREEN WITH 'SOMAL.LAND' VARIETY. LIGHTLY HINGED MINT. Somaliland Protectorate collection of fine used on leaves. Includes 2 Rupee Victorian, overprint at bottom of stamp, 1953-58 definitive set etc.